We all need to escape sometimes. My particular sort of escaping is usually under her arm as she opens the gate. I tear off into the field with the long grass and I see how many greedy mouthfuls of grass I can stuff down me before she catches up with me again. I have been known to trot off up the farm lane, but if I’m honest, I don’t like being too far away from my friends, so I usually wander back myself. Escaping is OK, but I don’t want to be lost and lonely. 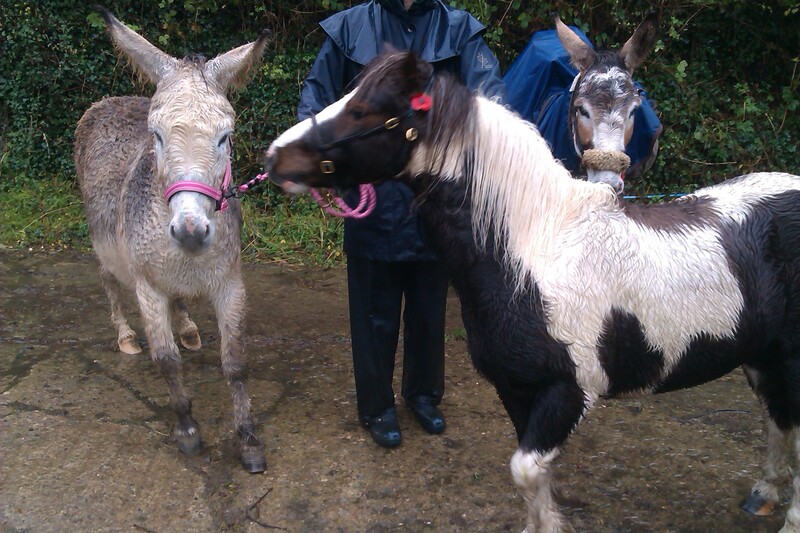 You can read about our escape with Hannah earlier in this blog: https://hooveswho.com/2013/11/03/donkey-walking/ but I have some excellent news! Hannah has written the book! Hannah made quite a number of discoveries on her journey and she shares them in a very honest and fearless way. Guess walking makes you brave, donkeys make you forget yourself and family make you proud. 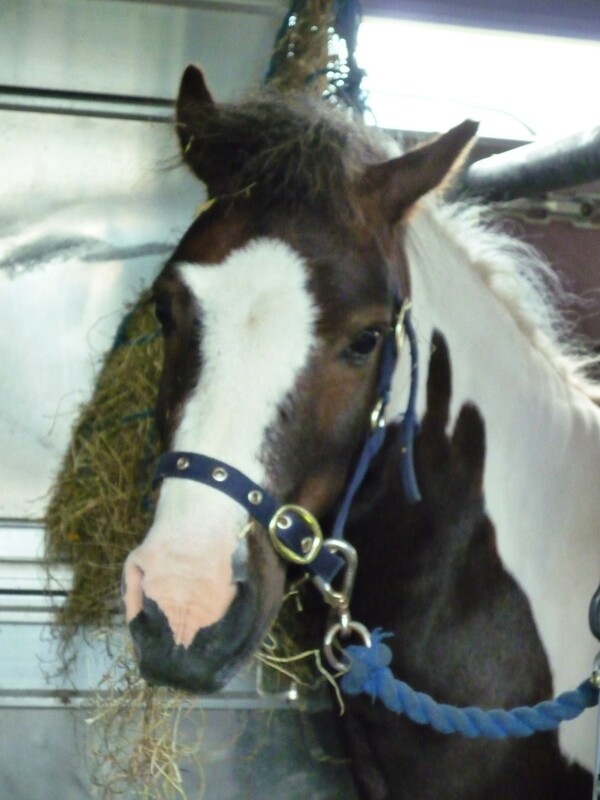 Don’t take the word of a pony though – even if he has been immortalised in print. Go and buy a copy – you too can escape! This entry was posted in Coastal Path, Hannah Engelkamp, Life and Times, Penbryn, Seaside Donkey and tagged Hannah Engelkamp. Donkey walking, Seaside Donkey on June 8, 2016 by sallylearoyd. It has been a year of change for us here and change is always a challenge (it has a lot of the same letters). We started off the year chasing our tails as ever, but then in March we left the RSPCA (Happy New Year to the RSPCA). 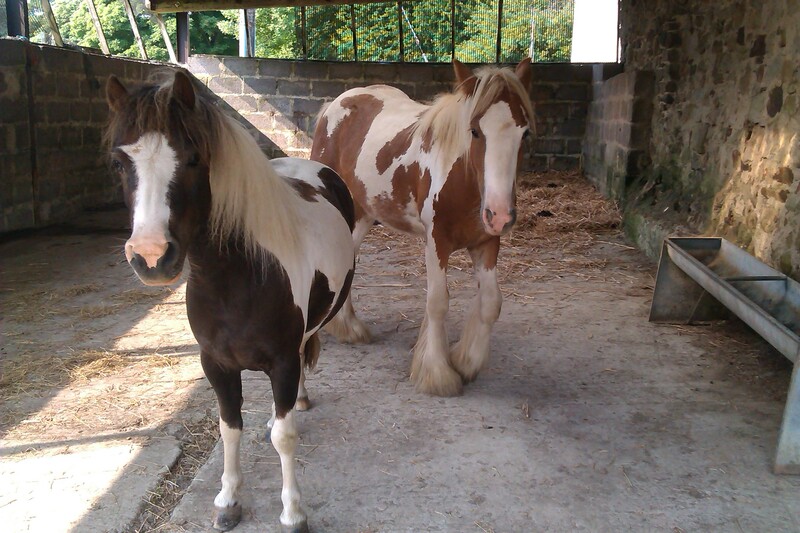 We still welcomed some poorly ponies to the yard, to help them to recover before rehoming. I help a lot with that, you know, keep them company and play and stuff to cheer them up when they are a bit blue (Happy New Year Bill, Ben, Timothy Too (get it? ), Hobbits, Paula and little Hari). They have all moved on to new lives now and we hope they will have long and happy ones. The summer was hot and lasted longer than usual – guess we had more time to enjoy it. I was on my usual diet so my feet don’t hurt, but I have a regular ride and lead date with the big guys. I love ride and lead! 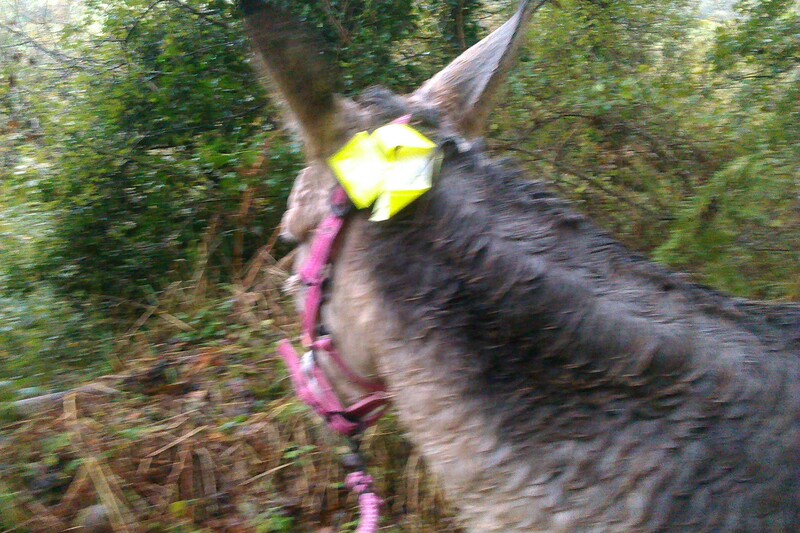 In the autumn, we walked with donkeys which was a new thing for me. Luckily I liked that too (Happy New Year Chico Florence and Hannah). Then we got new cats for the yard (Happy New Year Winston, William and Tilly). Now we are in winter routine and I am in the stable each night because the frost can make my feet hurt worse than over eating! I like a routine and I am quite happy to bring myself in at night, as long as someone opens the gate for me. My new year resolution is to keep trying to improve things for my friends who are not as lucky as I am. I keep in touch with my old friends at the horse charities (Happy New Year to Nicolas at Redwings and all of his teams of helpers at the NEWC charities). The work they do is crucial and they have had a tough time in 2013. And before I go to bed (yawning, I was up late last night) I wish the best of Happy New Years to Sally, Sarah, Joanna, Steve and Rob. They care for me and I care for them. OK. 2014. Bring it on! 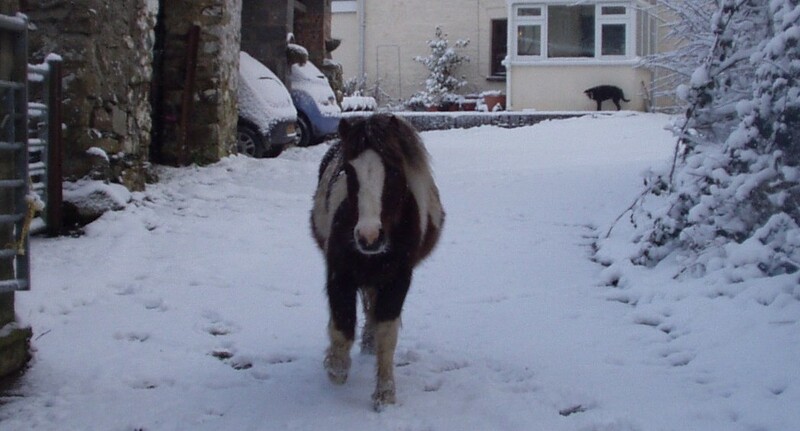 This entry was posted in Hannah Engelkamp, Horse welfare, Life and Times, Seaside Donkey, Uncategorized and tagged Animal Welfare, Blue Cross, British Horse Society, equine welfare, HAPPA, Happy New Year, horse welfare, horse welfare; equines; horses and ponies; showing., Horseworld, Redwings, rehabilitation livery, RSPCA, Seaside Donkey, World Horse Welfare on December 31, 2013 by sallylearoyd. As Hannah, Chico and Florence make their triumphant return to Aberystwyth (1000 miles, Hooray! ), I have been reflecting on my new donkey friends. 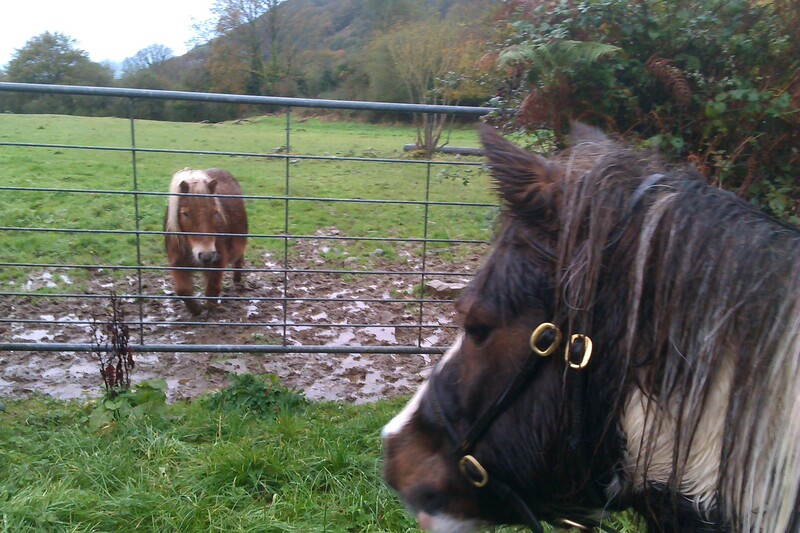 I can see there is a lot to know about them, because they are not ponies like me, although they may be equine. 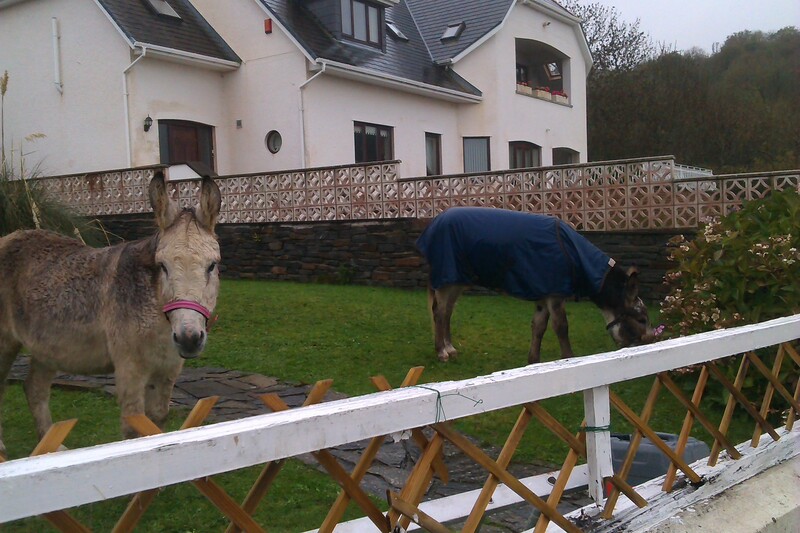 The thing is, those two donkeys are quite different and both deserve my respect for their enduring qualities. Chico is a ‘go to’ man, with a distinctly Mediterranean air about him. He is a big, rangy donkey with a long and steady stride. His coat is fine and shiny, as though he comes from a hotter country than this one. He wears a rain jacket because his coat contains no grease to keep him warm like mine does. Hannah weighs the luggage carefully so that his pack is always properly loaded and he carries it with ease. He likes to meet new friends and is always up for an extra carrot, but then he walks again. He knows his job. Florence joined the team near the end of their walk. She is a traditional British looking donkey with a thick coat, well-designed to protect her from the elements. She has taken to walking really well and seems very interested in each new experience. I am sorry to say that she did NOT appreciate my showing off, and turned her back when I pranced about. But we share a quality – our skill in PR. Flo is definitely the donkey diplomat of this pair. She greets new people with affection and prettily pricked ears, and endures any amount of hugging and admiration, carrots or not. How are we doing, donks? Hannah is lucky to have found two such interesting friends to share her journey. I hope I will see them again one day. 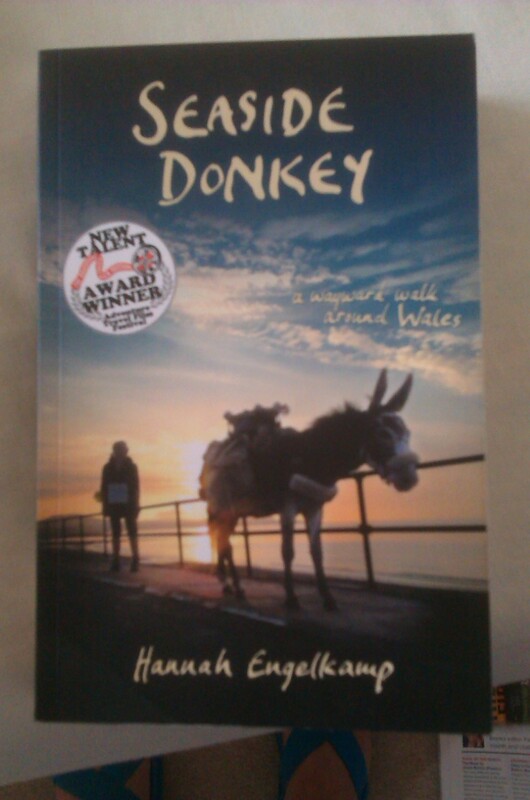 This entry was posted in Coastal Path, Hannah Engelkamp, Life and Times, Seaside Donkey and tagged Aberystwyth, Chico, Donkey, Florence on November 9, 2013 by sallylearoyd. is my new favourite thing! 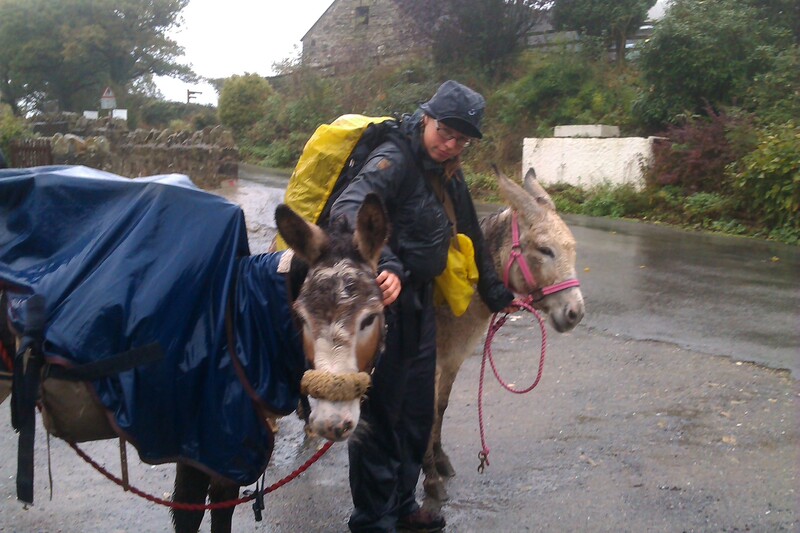 On Friday, I set out in the rain to meet Hannah and Chico, he is the famous Seaside Donkey. 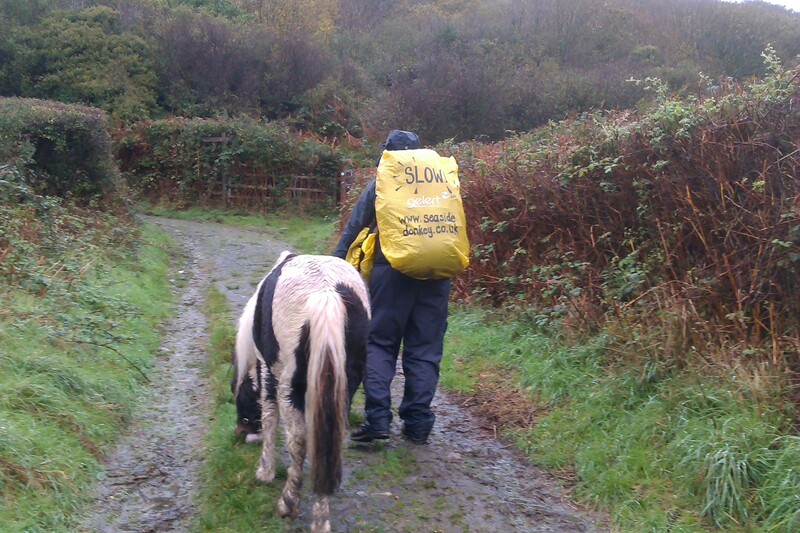 Hannah and Chico, by the time I met them, had already walked 960 miles around the perimeter of Wales. 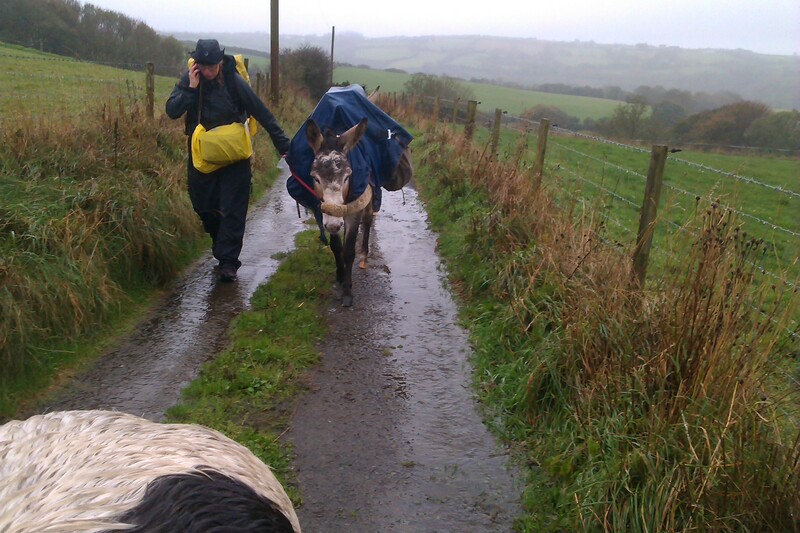 They were now on the home stretch; I had never met a donkey, so I joined them for the day on their walk. They have used the coastal path where possible, but today, I needed to show them the bridleways, because the path has stiles. First off, I brought them back to my place for a coffee stop and a rest – they had just climbed one of our famously steep hills from Tresaith to here. Hannah is loading Chico’s saddle. After an hour, and lunch for the donks and me, we set off for Llangranog (I wore my poppy today, to remember all the brave horses who suffered in the name of freedom). 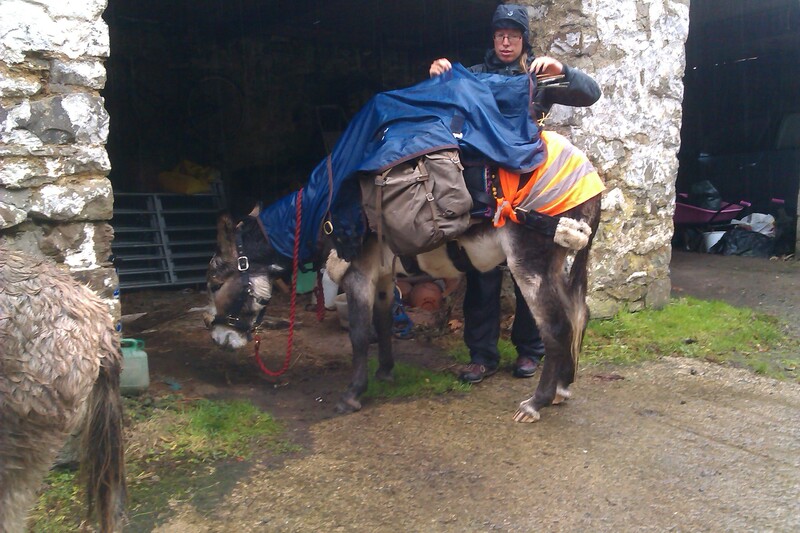 DId I mention that Chico and Hannah had gained a donkey only the day before? They met Florence at a camp site and decided to take her back to Aberystwyth with them (she has never been there). As long as we are off the road, Chico is allowed off the lead rein. He is an old hand at walking and would follow Hannah anywhere. Florence is new to this game – this was only her second day! While Hannah bothered with her, Chico was quite happy to follow me. Brainy guys, these donks. On our way up the lane we passed Paula and Hari. I don’t think they had seen a donkey before either! What on earth are they? The rain continued, and Hannah was busy on her phone, sorting out her accommodation for the night. This is a great and simple freedom, just walking with donkeys and ending up somewhere different each evening. Mum, bring me some dry pants please! 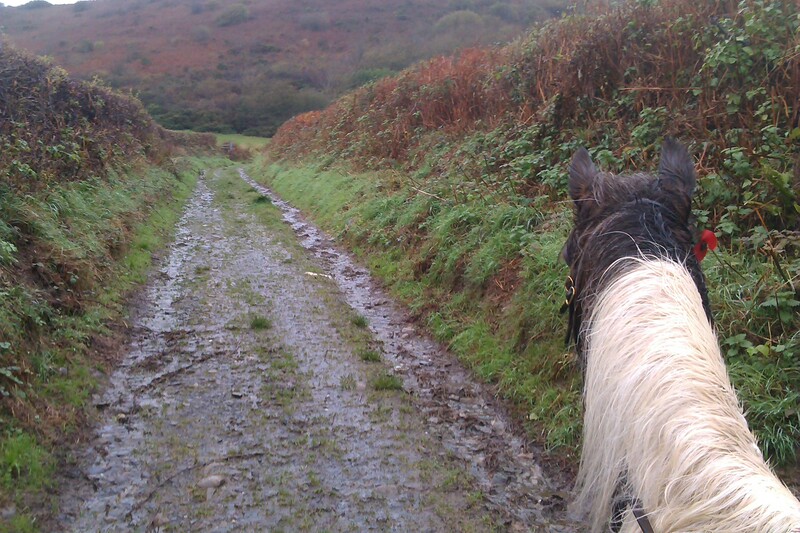 Negotiating the steep Parish Road down to Penbryn was easy for me and the donkeys, but entailed a bit of swearing from others about the muddy bit. When we got to the beach car park, the Cartws Cafe was open and they treated the muddy ones to a drink. We said ‘Hi’ to a few fans and moved steadily on our way. Next was the best bit. We found a path up the hill and through the trees! 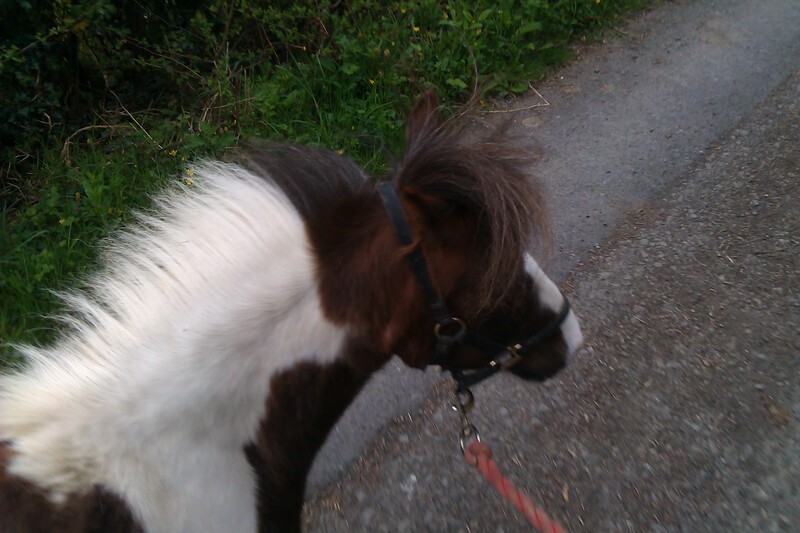 Then Hannah said she wanted to lead me – she is not familiar with pony walking. I was pretty well behaved, all things considered. I like Hannah; she and I have a lot in common – we both have positive mental attitude. We are both good walkers as well. Quite soon we were well ahead of her and the donkeys, but fortunately, they managed without us. We don’t hang around, Han and me. I think she was having a bit of a daydream actually. I could hear her rabbiting away to both donkeys, like she does. It’s a lovely gentle thing to do, is donkey walking. 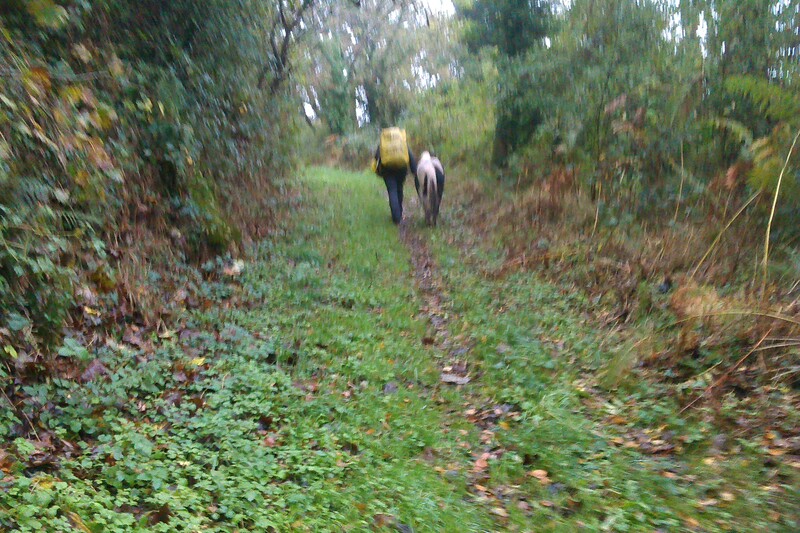 Soon we reached the turning onto the lane to MaesyMorfa, where Hannah and the donkeys were going to stay the night. I set off for home, because it would soon be dark. I met a new friend on the way home! This was the furthest I had ever walked in my life and I had the best time! She always comes to see I am OK, late in the evening when we have had a day out. That night, she brought a carrot and she said she was proud of me. Well, I can understand that. 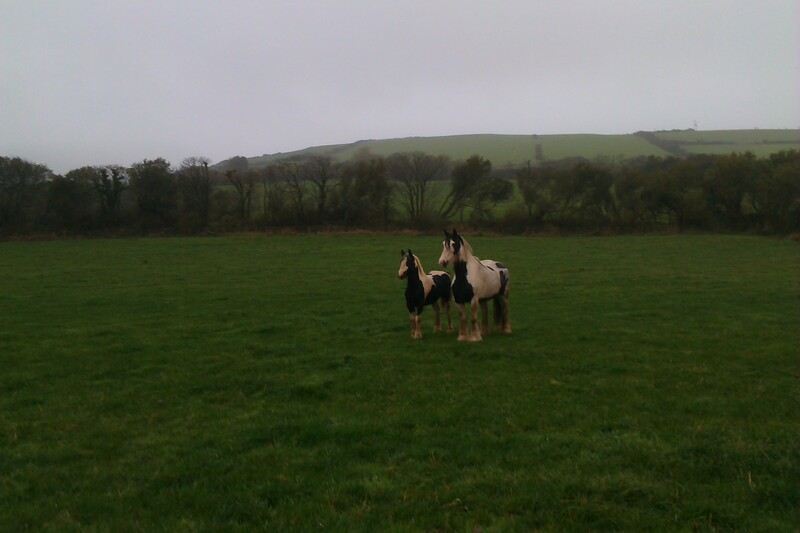 This entry was posted in Cartws Cafe, Coastal Path, Hannah Engelkamp, Life and Times, Llangranog, Penbryn, Seaside Donkey and tagged Aberystwyth, Donkey, Penbryn, Seaside Donkey, seasidedonkey.co.uk, Tresaith, Wales on November 3, 2013 by sallylearoyd.